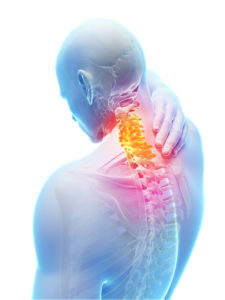 Neck aches, pain, and stiffness are something people suffer from time to time. They are usually brought on by a spinal misalignment caused by overworking or holding the head in an awkward position, such as sleeping in an incorrect posture. Fortunately these minor aches and pains usually clear up after a day of rest or a good night’s sleep. Unfortunately, the underlying problem continues. Don’t sleep on your stomach. This can cause harmful stretching and twisting of the neck muscles. Don’t sleep on a stack of several pillows. Doing so will put stress on the upper back and neck. Don’t watch television or read while lying down. This can contort the neck. Always sit upright. Take frequent breaks or change positions when doing work that requires you to bend your neck downward or face the same direction for a long period. Avoid purses or bags with shoulder straps. The weight can pull on the neck and disturb the nerves that support the shoulders, arms, and hands. Instead, tie a knot in the shoulder strap and carry the purse or bag in your hand. Recurring aches, pains, and stiffness in the neck are often symptoms of a serious problem. In fact, repeated episodes of stiff neck often indicate the early stages of joint or disc degeneration. If these underlying problems are left untreated, they can lead to permanent damage to the neck and a lifetime of constant pain. IS MY NECK PAIN SERIOUS? A neck that is relatively pain-free in the morning and worsens as the day goes on frequently indicates strain, fatigue, or muscular weakness. A neck that is stiff and painful in the morning and feels better as the day goes on may indicate underlying disease such as arthritis. Neck pain that is aggravated by coughing or sneezing may indicate serious disc involvement. Dizziness, light-headedness, or pain that develops when the head is turned or elevated is strong evidence of a neck problem. IS IT MORE THAN JUST A PAIN IN THE NECK? The following test can help measure the severity of neck pain. Check any of the symptoms that you have experienced or are currently experiencing. If you checked any of the above, you may have the symptoms of a serious neck problem. Call our office to schedule a consultation with a qualified doctor before the symptoms progress into a serious problem. The seven cervical vertebrae (also known as spinal bones) in the neck have highly mobile joints, allowing you to bend your head forward, backward and rotate as necessary. Because of its extreme flexibility, the neck lends itself easily to injury and pain. Your neck is the vital passageway that allows your brain to communicate with the rest of your body, coordinating almost all bodily functions. Even minor injuries can easily cause damage to the supporting muscles, tendons, ligaments and vertebrae of the neck. If left untreated, this can cause major disruption to even the most basic of bodily functions. So a simple injury left untreated can become more than a pain in the neck. Neck pain can be serious. Before you get to the point of regular neck pain, spinal degeneration or worse, schedule a complimentary consultation with our Denver Chiropractor today!